CARACAS (Reuters) — Venezuelan President Nicolas Maduro on Monday celebrated the election of a new legislative superbody that is expected to give the ruling Socialist Party sweeping powers and mocked U.S. criticism that the vote was an affront to democracy. At least 10 people were killed on Sunday in protests against the unpopular Maduro, who insists the new body known as the constituent assembly will bring peace after four months of protests that have killed more than 120 people. Countries across the Americas, as well as the European Union, denounced the creation of the assembly, which will have the power to rewrite the constitution. The United States—the top market for the OPEC nation's oil—called the vote a sham, and officials in Washington said they were preparing oil-sector sanctions. 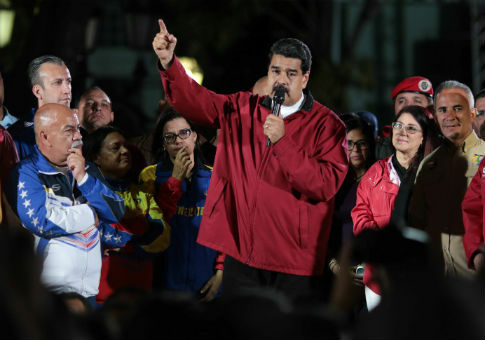 "A spokesperson for emperor Donald Trump said that they would not recognize the results ofVenezuela‘s constituent assembly election," Maduro told a crowd of cheering supporters following the completion of the vote. "Why the hell should we care what Trump says?" he added. "We care about what the sovereign people of Venezuela say." Opposition leaders call the election a naked power grab meant to keep the Socialist Party in office despite anger over an economic crisis that has spurred malnutrition and left citizens struggling to obtain basic consumer products. The country's elections authority said more than 8 million voters went to the polls on Sunday, while the opposition estimated only 2.5 million ballots were cast. Allies of the Socialist Party won all 545 seats in the new assembly, which will also have the power to dissolve state institutions such as the opposition-run Congress and sack dissident state officials. Maduro promised that the new assembly would quickly "restructure" the office of the chief prosecutor. The current top prosecutor, Luisa Ortega, was harshly critical of the plan to create the new assembly. Opposition leaders decried the vote as a fraud and called on supporters to protest again as of midday. "The constitutional assembly will not resolve any of the country's problems, it just means more crisis," opposition leader Henrique Capriles said on Sunday. "As of tomorrow, a new stage of the struggle begins." Latin American nations from Argentina to Mexico, which are historically wary of siding with Washington in hemispheric disputes, sharply condemned the vote. Several refused to recognize the results, while Spain and Canada joined in the condemnation. The EU said the constituent assembly could not be part of the negotiated solution to the country's crisis, noting it was elected under doubtful and often violent circumstances..
Socialist party No. 2 Diosdado Cabello on Sunday hinted that the constituent assembly would hold sessions in the same legislative palace as the existing congress, which the opposition took over in a landslide 2015 victory. "They kick us out the door we come back through the window," he told a news conference. "We never surrender. We insist and insist until we win. Today we feel victorious." The opposition organized an unofficial referendum over Maduro's plan earlier in July, when more than 7 million voters overwhelmingly rejected his constituent assembly and voted in favor of early elections. This entry was posted in National Security and tagged Nicolas Maduro, Venezuela. Bookmark the permalink.